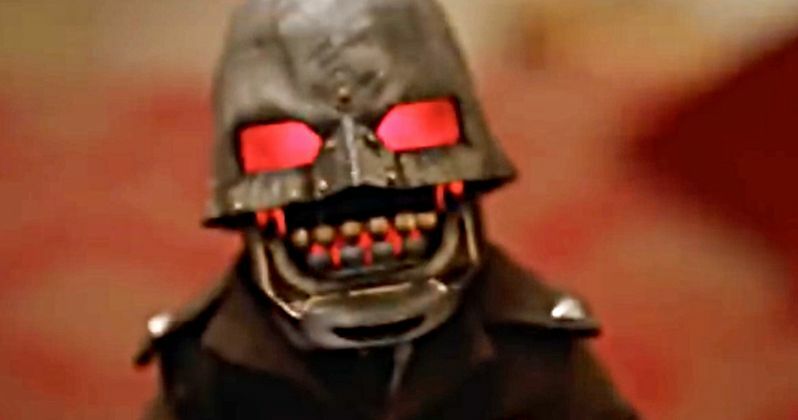 The Puppet Master franchise is back in a big way, with a terrifying new installment from RLJE Films, Cinestate and most important of all, the resurrected Fangoria, who have moved beyond the magazine to producer their own movies. This is also coming straight from the demented mind that created Bone Tomahawk and one of the producers of The Meg. Today, we have a blood-soaked first trailer for Puppet Master: The Littlest Reich, and it's going to grab you by the lungs and give a good squeeze till your wheezing on the floor begging for mercy. One thing's for sure, they've managed to capture that old Full Moon magic, and it might have you feeling just a bit nostalgic while it stiffens your spine. "Recently divorced and reeling, Edgar returns to his childhood home to regroup his life. When Edgar finds a nefarious looking puppet in his deceased brother's room, he decides to sell the doll for some quick cash. Girl-next-door Ashley and and comic book pal Markowitz join Edgar for a doomed road trip to an auction at a convention celebrating the 30th Anniversary of the infamous Toulon Murders. All hell breaks loose when a strange force animates the puppets at the convention, setting them on a bloody killing spree that's motivated by an evil as old as time." RLJE Films is set to bring this latest Puppet Master installment to theaters this summer, as opposed to just dumping it on VOD. Back in April they had this to say about the impending release. "We are incredibly excited to be able to bring the first film under the new Fangoria brand to audiences this summer. With an amazing script from S. Craig Zahler and performances from horror legends Barbara Crampton and Udo Kier, we know Puppet Master: The Littlest Reich will thrill fans of the original films and new audiences alike." Puppet Master: The Littlest Reich won't be getting a huge release. But it will appear on limited screens starting August 17, 2018. It's an interesting play, since The Meg is coming out just one week before, putting the two movies in late summer horror competition. If Littlest Reich isn't playing near you, it will still be unleashed on VOD in all it's blood-soaked glory. Sonny Laguna and Tommy Wiklund are directing the movie based on a script from Bone Tomahawk creator S. Craig Zahler. Thomas Lennon, who may seem like an odd choice at first, takes the lead in this wicked continuation of the Full Moon franchise. The rest of the cast is just as eclectic. We get the great cult wunderkind Udo Kier, Jenny Pellicer, the always weird Nelson Franklin, the completely bonkers Charlyne Yi, convention favorite Michael Pare and Barbara Crampton. And seriously, who doesn't love Barbara Crampton? You can check out the trailer for Puppet Master: The Littlest Reich, which comes from the very random Devon Oman and not RLJE Films or Fangoria. Even if you've never seen a Puppet Master movie before, or you've seen them all, this is something you're not going to forget anytime soon.